Our MIRO Glossary of Terms features words commonly used in the field of Institutional Research, as well as terminology used in reports developed by Mānoa Institutional Research Office. If there is a definition you feel we’ve missed or something you think we could explain a little bit better, please email us at miro@hawaii.edu. The academic year begins in the fall semester, continues through the spring semester, and ends in summer. Academic Year 2014 (or AY14-15) includes fall semester of 2014, and the spring and summer semesters of 2015. The percentage of applicants to a program or institution who are offered admission; also called the admit rate. The process by which an institution’s academic programs are reviewed by external agencies that evaluate the institution’s ability to deliver the education it promises. Regional accreditation for UH Mānoa comes from Western Association of Schools and Colleges Accreditation (WASC). Professional schools and various other programs are accredited by their separate professional groups. Click here for a list of accredited programs at UH Mānoa. Applicant who is offered admission to a degree-granting program at an institution (Common Data Set). An institution similar to UH Mānoa in many respects, such as student headcount, level and span of degree programs, scope, and mission; that possesses characteristics we aspire to achieve. Click here for a list of benchmark institutions. An institutional classification structure developed by the Carnegie Foundation for the Advancement of Teaching and used to identify groups of roughly comparable institutions. Classifications are based on a number of characteristics, including highest degree awarded and level of research activity. UH Mānoa’s classification is Research University (very high research activity). For institutions operating under a traditional academic year calendar, enrollment is reported as of the institution’s official fall reporting date or October 15 (IPEDS). At UH Mānoa, the census date for student is the fifth Friday of the term for Fall and Spring semesters and the tenth Friday for summer. Click here to find the current Census Freeze Date schedule. For faculty and staff reporting, the census date for annual report is usually October 31st. A taxonomic coding scheme for postsecondary instructional programs, intended to standardize the organization, collection, and reporting of data about enrollment, degrees awarded, and other aspects of educational programs. The CIP is the accepted federal government statistical standard on instructional program classifications and is used in a variety of education information surveys and databases (IPEDS). Class standing (sometimes referred to as “class level” or “classification”) is a traditional designation used to define a student’s progress toward their graduation goal. Undergraduate students are classified according to the number of credits earned (institutional and transfer credits). Click here for more information. Classified students are students who are pursuing an undergraduate or graduate degree. A group of people who share a common characteristic or experience within a defined time period. In institutional research, cohorts usually consist of full-time, first-year students who begin college in a given fall. An interactive online tool released by the U.S. Department of Education, that provides students and families information to compare the cost and value of higher education institutions. Learn more about College Scorecard here. A web tool that provides selected IPEDS data to assist students, parents, high school counselors, and others obtain information about nearly 7,000 postsecondary institutions in the United States and other areas. It offers a wide range of information including programs offered, retention and graduation rates, aid available, campus safety, accreditation, and estimated student expenses. A collaborative effort among data providers in the higher education community and publishers as represented by the College Board, Thomson Peterson’s, and U.S. News & World Report. The combined goal of this collaboration is to improve the quality and accuracy of information provided to all involved in a student’s transition into higher education, as well as to reduce the reporting burden on data providers. The CDS is a set of standards and definitions of data items rather than a survey instrument or set of data represented in a database. Each of the higher education surveys conducted by the participating publishers incorporates items from the CDS as well as unique items proprietary to each publisher. Consequently, the publishers’ surveys differ in that they utilize varying numbers of items from the CDS. Learn more about CDS here. A national survey used to collect demographic and attitudinal information about incoming students. It measures trends in higher education and serves as a baseline for longitudinal follow-up. The Office of Student Affairs at UH Mānoa administers the CIRP Freshman Survey. The last administration was in 2013. Click here for a list of research and assessment reports. The average amount believed to be adequate to cover the tuition, fees, books, and living expenses of the student for the 9 month academic year. Students enrolled in courses for credit and recognized by the institution as seeking a degree. High school students also enrolled in postsecondary courses for credit are not considered degree-seeking (IPEDS). A doctor’s degree conferred upon completion of a program providing the knowledge and skills for the recognition, credential, or license required for professional practice. The degree is awarded after a period of study such that the total time to the degree, including both pre-professional and professional preparation, equals at least six full-time equivalent academic years. Some of these degrees were formerly classified as “first-professional” (IPEDS). At UH Mānoa, the DARCH, JD, MD, DNP, and EdD degrees are considered professional practice doctorates. A PhD or other doctor’s degree that requires advanced work beyond the master’s level, including the preparation and defense of a dissertation based on original research, or the planning and execution of an original project demonstrating substantial artistic or scholarly achievement (IPEDS). At UH Mānoa, the PhD and DrPH are considered research doctorates. At UH Mānoa, ethnic statistics are reported for Asian and Native Hawaiian/Pacific Islander racial groups. Ethnic groups within the term Asian include Japanese, Chinese, Filipino, Korean, Thai, Vietnamese, Laotian, Asian Indian, Other Asian, and Mixed Asian. Ethnic groups among Native Hawaiian or Pacific Islander include Native Hawaiian or Part-Hawaiian, Guamanian or Chamorro, Micronesian, Samoan, Tongan, Other Pacific Islander, and Mixed Pacific Islander. Click here for more information. Persons identified by the institution as such, typically include those whose initial assignments are made for the purpose of conducting instruction, research or public service as a principal activity (or activities). They may hold academic rank titles of professor, associate professor, assistant professor, instructor, lecturer or the equivalent of any of those academic ranks. At UH Mānoa, Faculty include instructional faculty, research faculty, specialist, librarian, extension agent, and lecturer. The Executive Policy – Classification of Faculty provides detailed definition of faculty definition. Faculty Ranks include Professor, Associate Professor, Assistant Professor, and Lecturer. The Executive Policy – Classification of Faculty provides detailed definition on duties and responsibilities of faculty with different ranks. According to the U.S. Department of Education, First-professional degrees represent a category of qualifications in professional subject areas that require students to have previously completed specified undergraduate coursework and/or degrees before enrolling. They are considered graduate-level programs in the U.S. system because they follow prior undergraduate studies, but they are in fact first degrees in these professional subjects. A first-professional degree is an award that requires completion of a program that meets all of the following criteria: (1) completion of academic requirements to begin practice in the profession; (2) at least 2 years of college work prior to entering the program; and (3) a total of at least 6 academic years of college work to complete the degree program, including prior required college work plus the length of the professional program itself. Click here for more information. A student attending any institution for the first time at the undergraduate level is considered a first-time, first-year student. This classification includes students enrolled in the fall term who attended college for the first time in the prior summer term. It also includes students who entered with advanced standing (college credits earned before graduation from high school). A 12-month period used for calculating annual financial reports. At UH Mānoa, the State fiscal year runs from July 1 through June 30. A full-time equivalent measure is a way of equating the number of full- and part-time individuals. For Lecturers, FTE is based on the number of credit hours taught and the type of institution. At UH Mānoa, 7 credits = 50% FTE. Please contact the Human Resources Office for more details. FTE refers to Full-Time Equivalent. It is a key metric for measuring enrollment. Two common methods are used to calculate FTE, one method is based on students’ full-time part-time status (Full-time = 1 FTE and Part-time = 1/3 FTE); the other method is based on number of credits (UG credits/15 and GR credits/12). Generally, an undergraduate student enrolled for 15 or more credits or a graduate student enrolled for 12 or more credits in a semester. Geographic origin is a measurement developed by Mānoa Institutional Research Office to identify the geographic region a student comes from. Options include state of Hawai’i, U.S. Mainland, U.S. National/CFAS, and international. Grade point averages (GPA) are determined by dividing the total number of grade points by the total number of credit hours for which a student has received letter grades (excluding I, NC, CR, W, or L). The semester GPA is calculated on any one semester’s credits and grade points. The cumulative GPA is calculated on all such work taken at UH Mānoa. Click here for more information. At UH Mānoa, the Office of Graduate Education has overall responsibility for all aspects of graduate education. The Graduate Division oversees (1) development, implementation and assessment of graduate programs; (2) appointment and evaluation of graduate chairs and faculty; (3) admission and guidance of graduate students from matriculation through graduation. The percentage of students in a given cohort who graduate within a specified period of time is the graduation rate. Four years, six years, and eight years are typical standards for measuring a first-time, full-time cohort’s graduation rate. Headcount enrollment is the number of students who attend a school, regardless of full-time or part-time status, or number of credits taken. Headcount is the sum of students enrolled for credit, where each student is counted only once during the reporting period, regardless of when the student enrolled (IPEDS). The relative numerical position of a student in his or her high school graduating class, calculated by the high school on the basis of grade-point average, whether weighted or unweighted is their high school class rank. At UH Mānoa international students are defined as non-citizens for internal reporting purpose, but defined as either non-citizens, resident aliens, or US Nationals/CFAS Citizens for some international rankings according to those rankings’ definitions. College and university rankings are rankings of institutions in higher education, ordered by combinations of factors. Five of the most popular international rankings include Shanghai Jiao Tong University’s Academic Ranking of World Universities, QS World University Ranking, TIMES World University Ranking, National Taiwan University Ranking, and U-Multirank. In addition to entire institutions, specific programs, departments, and schools are also ranked. The core postsecondary education data collection program for the U.S. Department of Education. IPEDS is a single, comprehensive system designed to encompass all postsecondary institutions and educational organizations. The IPEDS system is built around a series of interrelated surveys to collect institution-level data in such areas as enrollments, program completions, faculty, staff, and finances. A mixed method study that was led by Student Affairs to understand perspectives of students who left the institution without achieving a degree, conducted twice in 2006 and 2012. The National Survey of Student Engagement focuses on the quality of undergraduate learning and assesses the extent to which students engage in educational practices that have shown to be associated with high levels of learning and development. The survey is administered to first-year students and seniors. Students who take courses, but do not aim to get a degree from the university are non-degree seeking students. They might take courses due to specific needs or for self-satisfaction. A person who is not a citizen or national of the United States, but has a visa allowing him or her to stay on a temporary basis. Nonresident visas are issued for purposes including business, travel and study. 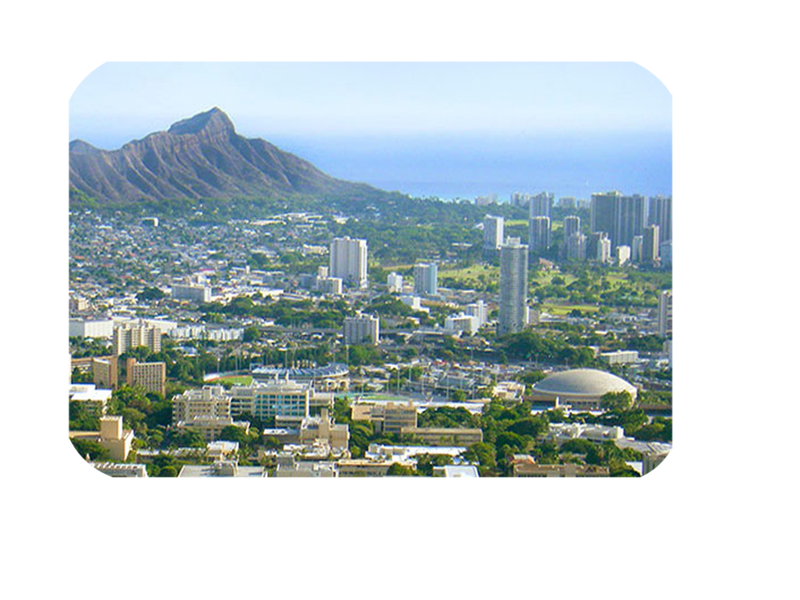 An institution similar in role, scope, or mission to UH Mānoa that is used for Peer Analysis. Click here to see UHM’s list of peer institutions. Persistence is a combined measure that indicates student success. The persistence rate of a cohort of students is calculated by the number who are still enrolled or have graduated within a defined period. Categories that are used to describe groups to which individuals belong, or are identified with in the eyes of the community. Racial categories used by UH Mānoa are American Indian/Alaskan Native, Asian, Black/African American, Hispanic/Latino, Multiracial, Native Hawaiian or other Pacific Islander, and White. Non-citizens are reported as nonresident aliens, or international students. Students are defined as Native Hawaiian or Other Pacific Islander if they have the following origins: Hawaiian or Part-Hawaiian, Guamanian or Chamorro, Mixed Pacific Islander, Micronesian, Samoan, Tongan, or Other Pacific Islander, he/she will be reported as Native Hawaiian or other Pacific islander. Otherwise, students can provide their own definition of their racial category or select “ethnicity unknown.” Click here for more information. Regression modeling is a statistical method that is used to predict one variable from one or more other variables. Predictions help us understand the relationships amongst variables, which in turn, enables us to account for past events, or even forecast future events. A person who is not a citizen or national of the United States, and who has been admitted as a legal immigrant with permanent resident status, or a person whose status qualifies them to the rights associated with permanent residence is classified in this way. Student retention is the re-enrollment of (typically) undergraduate students from college matriculation through the completion of a college degree. Student retention cohorts may be defined in various ways, e.g., first-time full-time, first-time part-time, etc.. Likewise, the retention rate may be calculated in different ways such as from the freshman to sophomore year, or from the first fall enrollment through the expected graduation date. The SAT composite score is the sum of the test-taker’s scores on the three sections of the SAT Reasoning Test: the writing section, the critical reading (formerly verbal) section, and the mathematics section. The maximum score is 2400. The ratio of full-time equivalent students to full-time equivalent instructional faculty comprises the student/faculty ratio at an institution. Undergraduate or graduate student teaching assistants are typically not counted as faculty when calculating an undergraduate student/faculty ratio. Tenure is a commitment that assures academic freedom by protecting designated faculty members from dismissal or disciplinary action because their views may be unpopular or contrary to the views of others. Tenure may be awarded to a faculty member through a review process initiated after a specific number of years of service. The award of tenure gives the faculty member the “contingent right” to continued employment, and may be terminated only for just cause after a careful process. Some faculty positions are not designated as being in the “tenure track” (the path leading to consideration for tenure). Time to degree indicates the number of calendar years that elapsed between the start of a student’s first term as a degree-seeking student and graduation (commencement date). It is usually calculated by creating a graduation cohort that consists of the students who completed a type of degree (for example, Bachelor’s degree) in a given year, and looking backwards to measure the amount of time (including summers) between their first term as a degree-seeking student and graduation (commencement date). The percentage of admitted students who enroll is the yield rate.